It has been an eventful week; where to start? The first few days of August are historically difficult to predict, that, and in combination with the sockeye opening that was announced on August 1st has everyone talking. Locally, we have had good numbers of coho during the week. In the morning hours, on the flood tide we have found them close to the mouth of the Capilano at 70-50 ft. on the riggers, and on the ebb we have done well along the West Vancouver coastline. The classic white hoochie setups have produced, but we have also had good numbers caught on spoons and anchovies. 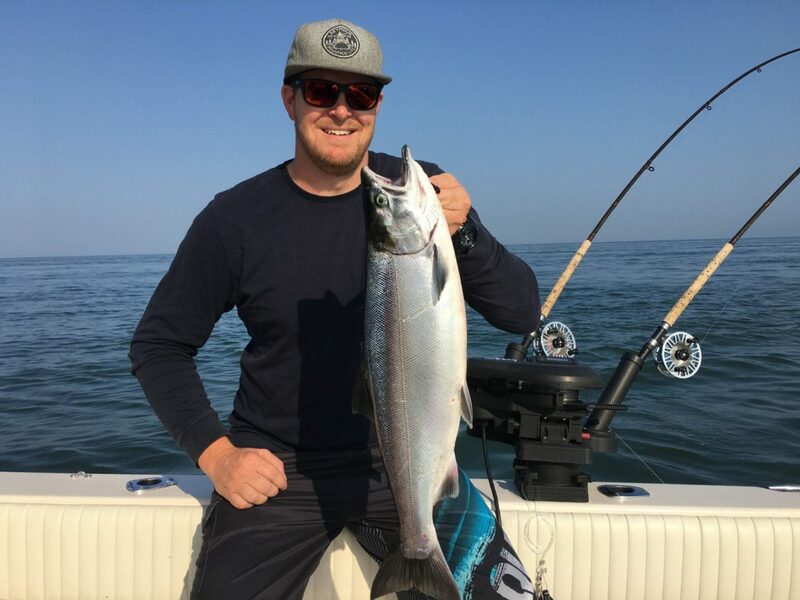 While the chinook run isn’t quite here in force yet, a good strategy is to run anchovies or spoons on the lower rods for chinook, then a mini hoochie and a “big ugly” hoochie on the top rods for coho. In terms of spoons, 3.5-inch Irish cream is my favorite, and for teaser heads I like either a green glow or a UV purple. Chartreuse flashers have been a favorite lately for our guide team. The strong SE winds this week have made the Hump harder to fish, but the coho are there and we also picked up some chinook in the mid 20s. Some of our charter boats have prospected the Bell Buoy and further down to T-10 and the Sandheads area but I haven’t heard of any significant reports yet. There are fish around, but it’s not red hot yet. That area will pickup anytime now, perhaps this weekend. For sockeye we recommend using 3-4 “dummy flashers” and then two flashers with small hoochies above that on the cable. The best colour hoochies historically have been hot pink with a glow head or a glow strip. Productive leader lengths have been from 22” up to 31” but most anglers fish about a 28” leader of 40 or 50 LB test. When it comes to flashers, the more flashers in the water the better. Sockeye love to follow the gear and will follow you, not the other way around if you make a big enough appearance. A great way to put those flashers you normally don’t use to good use. We have a sockeye diagram at our Pacific Angler retail location, which shows exactly how we fish for sockeye on the guide boats. Come by the store for that and your tackle needs. Tim beat the heat on the water this week and enjoyed some great fishing. Since the announcement of the tidal sockeye salmon opening, our charter hotline has been ringing off the hook. 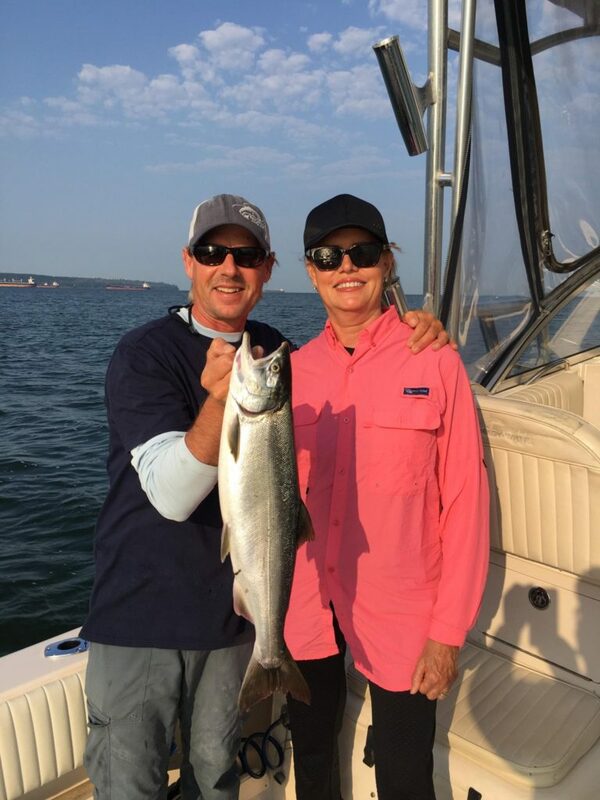 If you want to get out and experience this incredible fishery using our top of the line Grady White charter boats run by our expert guides, give me a call at 778-788-8582 to lock in a date – we are filling up fast but some prime dates are still open. This year’s Vancouver Chinook Classic is SOLD OUT! But that doesn’t mean you can’t join in on the premier catch and release tournament and get your shot at the $15,000 first place prize. We’ve had a last minute cancellation on one of our Grady Whites that is entered in the tournament. Call us today to charter this boat and enter in the tournament. This is the premier, nonprofit catch and release salmon derby fundraiser for the Pacific Salmon Foundation & Sport Fishing Institute. 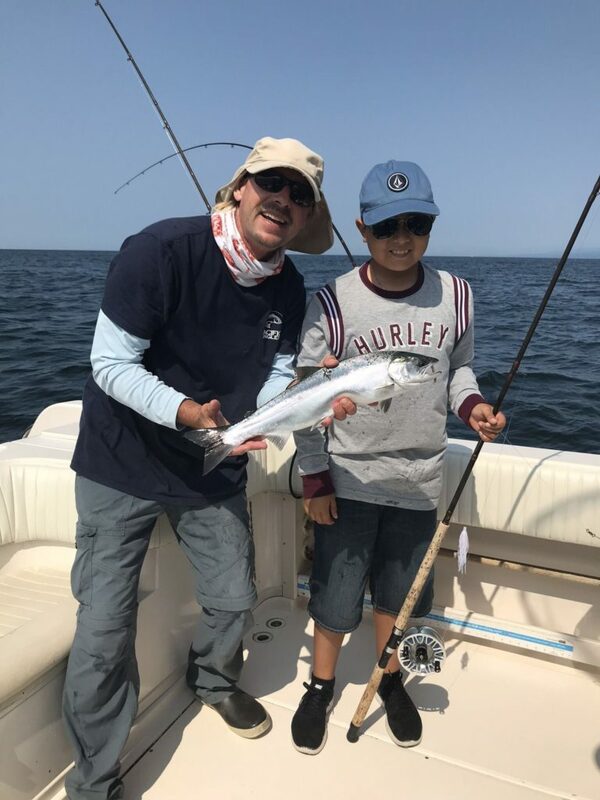 We look forward to seeing everyone out on the water again this August – fishing and having fun in the sun competing for the large cash prizes! Thanks to all who participate, donate and support! We welcome all anglers from novice to expert and look forward to seeing everyone again soon – let the fun times begin!